You've seen our book journals. The big ones. 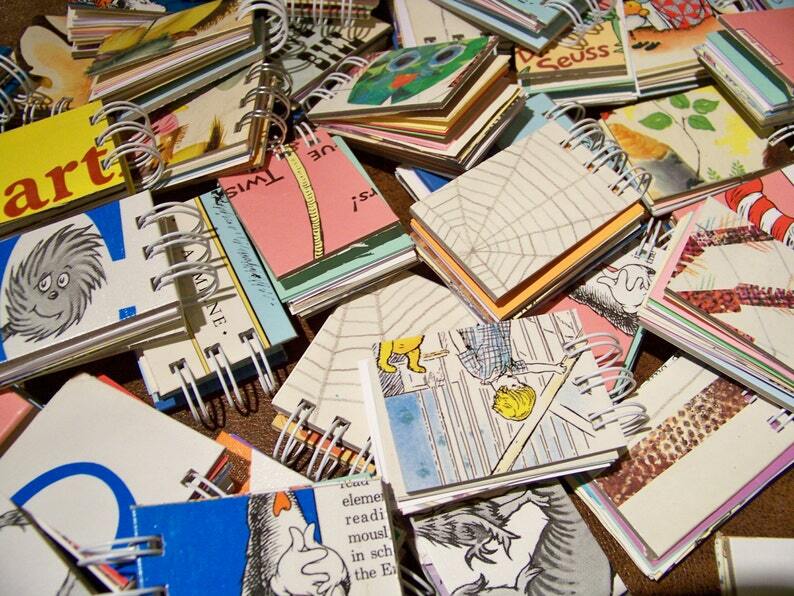 The treasures crafted from children's classics and awesome old books. Well, imagine we chopped up some super fun children's classics, such as Dr. Seuss, and made tiny baby mini book journals? Well, that's exactly what we do. And you can order any quantity (within reason) for party favors, shower gifts, tokens, prizes, stocking stuffers, place cards ... think creative, people, this is etsy for goodness sake. Each mini journal contains blank colored writing paper plus some colorful pages from children's books sandwiched between two smaller hard cover sections of a children's book, all bound together with sturdy wire O. We make these little gems (and I mean little, like they measure 2 inches x 3 inches) for ArtOMat, and if you haven't heard about how ArtOMat reclaims and repurposes old cigarette machines, please check them out at www.artomat.org. Each journal is different. Yes, you may custom request certain books for your minis and we really will try to find your favorites. Or trust that we've found equally exciting books to craft into minis. Custom orders. Name your quantity. This listing is for 20 minis. If you require a different quantity, please convo. Cute idea. Good for gifts. Dr. Seuss Oh, the Places You'll Go! blank book diary journal graduation gift graduate teacher keepsake grade school "class of 2019"